South Korea’s birthrate has been in free fall in the past several years, but either despite or because of this, the interest in prenatal care among mothers-to-be is on the rise. The result has been increased consumer demand for baby products and prenatal care services. The industries that are benefiting from the prenatal care market boom are retailers and hotels, with a rising number of customers looking for premium baby products or staycation products in line with the popular “babymoon” trips. “When I was pregnant, I gained a lot of weight and felt depressed due to the increase in estrogen levels. But when I went to Jeju and stayed there for several days, I felt better as I relaxed by the beach and walked in the forest. I also noticed that my baby was moving more during the stay because he also felt good,” wrote an author Woo Hee-kyung, who published a book on her recommendation for a babymoon trip to Jeju. Hotels and resorts here or even in overseas cities like Guam, Okinawa and Cebu are popular destinations for babymooners. And leading hotels here are offering promotional packages specifically designed for expectant parents. Lotte Hotel offers special hotel room promotions starting from 268,000 won ($237), which include a set of organic baby clothes. Walker Hill Hotel also runs hotel room promotions for pregnant customers, which include a prenatal education class and beauty class. Other promotions include complementary skin care sets specially made for pregnant women. An increasing number of outbound travelers for prenatal care trips has also led to boosted sales of related products at duty-free stores. According to Hotel Shilla, an operator of Shilla Duty Free, sales of baby products at its online duty-free mall went up by 90 percent from January to June this year compared to the same period last year. As of this year, the number of baby goods brands sold at Shilla DFS increased to 53 from nine in 2015. A popular baby brand Manuela saw its sales increase by 290 percent in the first six months this year from a year ago, adding that 40 percent of the customers of overall baby goods were women in their 30s. 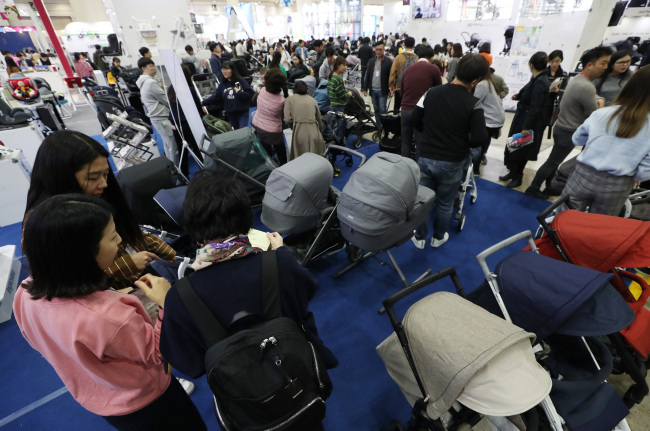 According to a baby fair operator Mom and Baby Expo, about 19 percent of some 100,000 visitors said they participated this month’s baby fair to have a look at prenatal care products. It was followed by those who were interested in baby carriages or baby car seats, which were the best-selling items at baby fairs over the past three years. “Baby fairs are very informative and useful to visit before giving birth to a baby, because I could not only buy the baby products at a good price but also learn useful tips from mothers and related industry people,” said Kim Jin-seo, 28-year-old mother who gave birth this summer. Online retailers like Coupang are also riding on prenatal care boom, by opening baby and prenatal-product categories for mothers. Some 70,000 items ranging from wrist guards to maternity underwear are sold at Coupang, including over 400 products from foreign brands for direct overseas delivery. Officials said its products are categorized into items needed for before giving birth, after delivery, and items for infants, which allows pregnant women to search for items conveniently. Insurance products for infants are also gaining popularity. Major insurance companies here -- Hyundai Marine and Fire Insurance, Meritz Fire and Marine Insurance, KB Insurance -- offer insurance products for parents to prepare for their babies before giving birth. Cover ranges from infant surgeries when a baby was born with a disease to medical checkups as the baby grows. Companies recommend parents buy baby insurance within 22 weeks of a pregnancy being confirmed. “With different types of pregnancies these days, such as via artificial fertilization, insurance products have become more diversified and offer wider coverage for pregnant women,” said a Hyundai Marine and Fire Insurance official.